As a close-range kitchen compliment this monitor might just get the job done. It is choosy about what signal it decides to display well - preferring 480 interlaced to progressive. This tells us that it is not calibrated for fine picture performance but instead Samsung has focused this LCD television in the direction of a simple TV which will take cable, DVD, and satellite and tuck away nicely into a corner. Black levels are acceptable which is not surprising considering the size of the unit (LCD TV displays have a much easier time with contrast and blacks in the smaller screen sizes) but the LCD monitor lost some of its definition during dark scenes. This, I found somewhat annoying. Another negative is the viewing angle, from which image quality and unit brightness drop off at around 40 degrees. Colors were sometimes muted although fairly realistic. 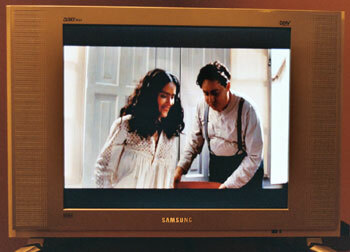 The picture became very sharp and clear from 9 feet when viewing a 480 interlaced signal from the DVD Frida. This DVD exhibits many dark scenes and I found the Samsung LTN1765 displayed best with the standard setting for this film. Other preprogrammed picture settings include dynamic - for viewing in a brightly lit room, movie - for displaying at darker levels with more contrast and deeper blacks, and custom - for customizing your own preference. Overall, my thoughts were that this LCD was fairly flexible in terms of picture optimizing adjustment. My optimum adjustments in a normal viewing environment were Contrast - 90, Brightness - 25, Sharpness 57, Color - 50, and Tint - 50. All of the preset picture adjustment settings mentioned before are well thought out for the LCD's capabilities. I found white balance very accurate on this unit. When watching cable through the built in Samsung LCD TV tuner, the unit displayed images with very limited pixelating artifacts though edges of images are slightly blurred - as with most LCD television sets. The Samsung LCD TV has an abundance of input options including 2 sets of component video inputs, a 15 pin VGA style input for PC, and plenty of audio left and right channel inputs to accompany the video inputs. Remote function and menu options are very thorough for a unit of this size. One feature I like a lot is the add/erase feature (controlled by button on remote of the same name), which allows the user to instantaneously add or delete channels in the TVs memory. At a street price of a little over $1000 this feature packed unit is a medium value LCD TV buy. Performance and features are well thought out for a monitor this small - but for $1000 they should be.